Resin jewelry making is getting really popular with the jewelry making enthusiast. Acrylic resin jewelry is easy and inexpensive to make which sure doesn't hurt it's popularity. Because of its versatility, lightness, and affordability, plus the introduction of easy to mix, low-odor products, resin’s popularity as a material for jewelry making has soared. 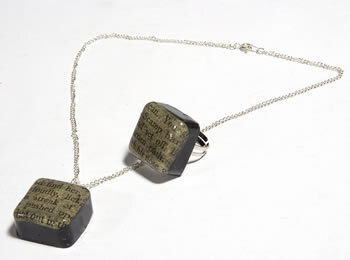 Resin jewelry is made from liquid plastic that turns solid when a hardener is added. It is typically made from something called "casting resin". Casting resin is a solution of two liquid chemicals that combine, then set, into a hard plastic. Casting resin is a crystal clear, low viscosity liquid that requires mixing with a catalyst to become rock hard (purchase catalyst separately). Casting resin makes an ideal material for small crafts, jewelry and toys, as well as household decorative projects. To use casting resin, the resin is poured into a mold and allowed to harden before the mold is removed. Resins used for casting are often clear, although they can be blended with pigments and dyes to create colored finished products. You might also hear the terms "ice resin", "jewelry grade resin" and "plastic resin" when you are looking for supplies to make your handmade resin jewelry. If you are just learning how to make resin jewelry, you might want to look at using bezels as resin jewelry blanks. 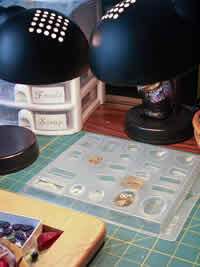 Bezels can provide a ready made base for your resin jewelry if you'd rather not fiddle with molds. The are many resin jewelry bezels available nowadays. A really inexpensive item to use as a bezel is a bottle cap. Bottle caps are a great base for making jewelry with resin. You can make candy resin jewelry by pouring the cast resin and add some tiny candies into liquid before it cures. Rubber and silicone molds are popular for diy resin jewelry makers because they are easy to use and no mold release needs to be applied before casting. Many people who work with casting resin make their own molds. Plaster and other materials can also be used for mold making, and a number of different styles of molds are available. Other resin mold materials include latex, plaster, metal, and fiberglass. Softer mold materials, such as silicon and soft rubbers, make ejecting the finished resin piece simpler, but rigid mold materials, such as plaster, fiberglass, metal, and wood, are less likely to warp with repeated use. Resin molds can be used to create plastic-like parts for use in manufacturing or for lightweight jewelry components. Backup molds are more rigid molds used to support flexible rubber molds during the resin-casting process. A backup mold prevents the primary rubber molds from distorting when casting resin is added. 3. Mix your casting resin according to instructions. 4. Pour the casting resin into the mold to cure. 5. Add any small objects (like sparkles, candies, sprinkles, small toy pieces) or additives (like coloring agents) you would like. These can be suspended and sealed within clear resin if added during the casting process. 6. Breathe gently on the surface of the resin to pop any air bubbles. You can also use a toothpick. 7. Let cure for 24 hours before unmolding. Be sure to keep your uncured resin away from dust particles by covering it with something. Getting Started: I suggest starting with a resin jewelry making kit. There are many kits available at crafts stores.These will include the resin, a mold, and possibly the bits and bobs to make a finished piece of jewelry as well. Bubbling: Bubbling, in which small pockets of air are trapped, is probably the most common problem encountered with casting resin. Blow gently on the surface of the resin to pop any air bubbles that rise to the surface. Working Life: Typically clear casting resin has a working life of 16 minutes and a demold time of 24 hours, but be sure to read the instructions as this may vary by brand.. Adding Color: It's possible to add pigments to your casting resin to produce vibrantly colored resin jewelry bits. Instructions vary depending on the brand of jewelry resin you are using, so carefully follow the manufacturer's instructions for adding color. Use resin dye to simulate the appearance of colored glass, gemstones or amber in making beads or cabochons for jewelry. Drilling Holes If you want to drill a hole in your resin jewelry, you must use a hand drill. Don't use a regular drill; even set at a low speed, it will generate too much heat and melt your resin jewelry. Resin Jewelry Findings: You can easily attach your new resin components to pre-made pendant plates and bails using E6000 glue. Then you don't need to drill hole at all. Resin jewelry making is pretty fun and easy enough even for a jewelry making newbie. It may take a little bit of trial and error to work out all of the details, but once you have experimented with a few batches of resin jewelry, you'll be amazed at what you can make with just a few simple and inexpensive supplies and pieces of equipment.